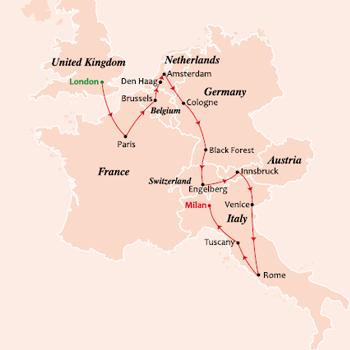 This 15-day tour lives up to its name by showcasing all that a Splendid European trip has to offer. Start off the tour in London, the capital city of England. On the final day, participants will enjoy a continental breakfast and depart back home. Download the full itinerary for full details. 2 nts at Holiday Inn M4J4 or similar in London. 2 nts at Mercure Marne la Vallee or similar in Paris. 2 nts at NH Geldrop or similar in the Netherlands. 1 nt at Achat Hockenheim or similar in Germany. 3 nts at Terrace Hotel or similar in Switzerland. 1 nt at Alpenkoenig or similar in Innsbruck. 1 nt at Splendid Galzignano Terme or similar in Venice/Padova. 1 nt at A Point Arezzo or similar in Arezzo. 1 nt at Green park Pamphili or similar in Rome. Bread, Butter, Jam, Cereal, Milk, Tea, Coffee and Juice. Welcome to London. You will be transferred to your hotel (Check-in time is after 1500 hrs). Overnight in London. Today, on your guided city tour see the Westminster Abbey, the Houses of Parliament, Big Ben, Trafalgar Square, Piccadilly Circus, the Tower Bridge and Buckingham Palace. Next, visit Madame Tussauds Wax Museum. Later, we take you for a ride on the London Eye – one of the world’s tallest Ferris wheels. Overnight in London. Today we go to Calais, France by the Eurotunnel train from Folkestone or by ferry from Dover. We then proceed to Paris and check-in to the hotel. This evening, we go on an Illumination Tour of Paris and see the famous landmarks of Paris – the City of Lights – magically lit up. A perfect end to this beautiful evening. We return to the hotel OR you can opt for the world famous Lido Show. Overnight in Paris. Today, proceed on a guided city tour to see the Place de la Concorde, the majestic Arc de Triomphe, the fashionable Champs Elysees and the magnificent Opera House. Later, we visit the Eiffel Tower. A bird’s eye view from the 3rd level will leave you breathless! Later, go on an exciting trip to Disneyland®Paris. Get charmed by Cinderella’s Castle. Take an exciting roller coaster ride down the Thunder Mountain. Visit Fantasyland and meet Alice in Wonderland, Pinocchio, Peter Pan and Snow White. Get thrilled by the legends of Aladdin and Indiana Jones at Adventureland. Overnight in Paris. Today, proceed to Brussels, the capital of Belgium. We view the adorable ‘Manneken Pis’ statue of a little boy, as well as the beautiful Grand Place. We continue onwards to The Netherlands. Overnight in The Netherlands. Today, visit the Keukenhof Tulip Gardens (till 19th May) – the world’s most beautiful spring garden. 20th May onwards – visit Madurodam, home to a range of miniature replicas of famous Dutch landmarks & also visit the beautiful Zaanse Schaans Village. Later enjoy a Canal Cruise. Also, make a photo stop at a windmill and visits to a traditional Wooden Shoe Factory and a Cheese Farm. Overnight in The Netherlands. Today, drive to Cologne and see the magnificent Cologne Cathedral and enjoy the bustling pedestrian area. Later, enjoy a stunning cruise on the River Rhine from Boppard to St. Goar. Overnight in Germany. Today, we drive through the famous Black Forest region of Germany. We stop at the Drubba – the heart of the Black Forest to witness a demonstration of how traditional Cuckoo clocks are made. Drive to Switzerland, famous for soaring Alpine peaks and sparkling turquoise lakes. We stop at Schaffhausen to admire the thundering beauty of the Rhine falls. Overnight in Switzerland. TToday is a free day OR we suggest a visit to Jungfraujoch – a majestic backdrop of ice, snow and rock with breathtaking views. Board the charming cogwheel train from Lauterbrunnen to Jungfraujoch, where you can enjoy the Ice Palace – while being encased in ice yourself! Enjoy a delicious Indian lunch on top. Later, visit Interlaken, one of Switzerland’s best-known health and pleasure resorts. Overnight in Switzerland. Today, visit Mt. Titlis, the highest peak in central Switzerland, ride two cable cars – the second of which is the ‘Titlis Rotair’, the world’s first rotating cable car. Weather permitting, you could take a stroll on the Cliff Walk – a 100m. suspension bridge 3,000m above the ground! Later, visit Lucerne – on an orientation tour see the Lion Monument and Kapellbrucke. You can also shop for Swiss souvenirs. Overnight in Switzerland. Today, drive to Austria. Visit the Swarovski Crystal World in Wattens. Later, on an orientation tour of Innsbruck and see the ‘Goldenes Dachl’ or Golden Roof and the Heiblinghaus, a building resembling a wedding cake. Overnight in Innsbruck. Today, proceed to Venice – built on over 100 small islands, separated by canals and linked by bridges. Enjoy lunch on a private boat en route to St. Mark’s Square. At St. Mark’s Square see the historic Ducal Palace, the romantic Bridge of Sighs, the exquisite Clock Tower and splendid St. Mark’s Basilica. We also visit the Murano Glass factory for a glass blowing demonstration. Overnight in Venice/Padova. Today, drive to Pisa and visit the ‘Field of Miracles’. See the Duomo – Cathedral, the Baptistry and the Bell Tower or the ‘Leaning Tower of Pisa’. Drive to Florence. On your guided walking tour see the Duomo, Piazza Signoria, the Palazzo Vecchio and many more sights. Overnight in Florence/Arezzo. Today, drive to Rome. Visit the Vatican Museum, the Sistine Chapel and St. Peter’s Basilica in the Vatican. On a guided city tour of Rome, you will see renowned sights such as the Victor Emmanuel II Monument. Later, visit the Trevi Fountain. Overnight in Rome. Today, we check out and drive to the airport for your flight back home. It’s time to say goodbye to all the new friends you have made. We hope you take back many happy memories of your holiday. We would like you to spare a few minutes of your time to write and tell us how you enjoyed your holiday and any suggestions you may have for the future. ‘Arrivederci, Au revoir, Auf wiedersehen, Vaarwel & Good-bye’ till we meet again! NOTE: Due to operational reasons, the routing of this tour may be changed. However, all the sightseeing will remain the same. Contact Raj Dhingra today to reserve your spot!